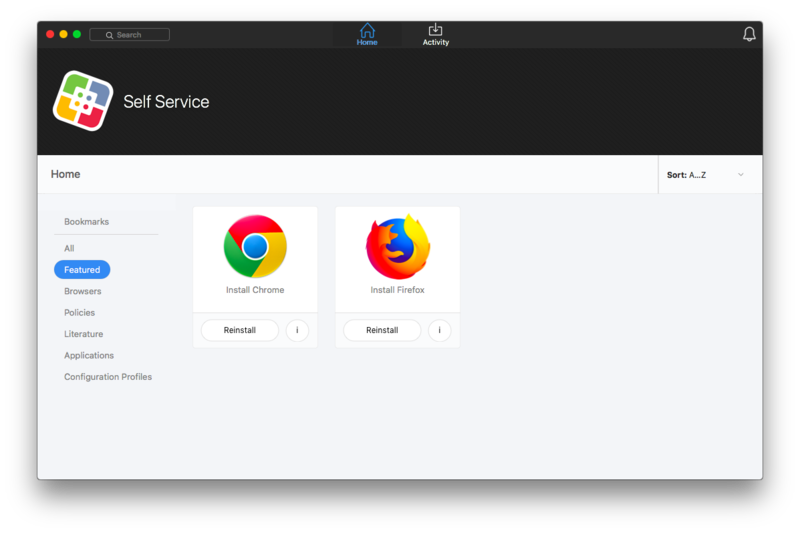 The Self Service Branding settings allow you to configure how Jamf Self Service for macOS is displayed by replacing the default icon, header image, and application name with custom branded elements to present end users with a familiar look and feel. Branding Icon—The branding icon displays on the Self Service Login page, in the branding header in Self Service, and as the Self Service icon in the Finder and the Dock. You can customize the branding icon by replacing the default Self Service logo with your organization's logo or another icon of your choice. It is recommended that you use a file with the GIF or PNG format that is 512x512 pixels. Branding Header—The branding header displays across the top of Self Service. You can customize the branding header image by replacing the default image with an image of your choosing. It is recommended that you use a file with the GIF or PNG format that is 1500x500 pixels. The Main Header field is automatically populated with the organization name you entered during the initial setup of your Jamf Pro instance. The Secondary Header field is automatically populated with "Self Service". Application Name—The application name displays in the Finder, the Dock, and in the app title bar and menu. By default, "Self Service" is displayed as the application name. You can customize the application name by modifying the Application Name text field. The screen shot below shows how the default branding settings look when viewed from the "Featured" category in Self Service. Once a change is made, it automatically appears in the Branding Preview field at the top of the page. You are now ready to start making items available in Self Service. For more information, see Making Items Available to Users in Jamf Self Service for macOS.